Honorary editor: Haerpfer C., D.Sc (Political Sciences), Professor, University of Vienna; Director, Institute for Comparative Survey Research “Eurasia Barometer”; President, World Values Survey Association, Austria. Editor-in-Chief: Nikolay P. Narbut, DSc. (Sociology), Professor,Head of Sociology Chair, RUDN University, Moscow, Russia. Indexation: Scopus, Web of Science — Emerging Sources Citation Index (Clarivate Analytics), Russian Science Citation Index, Google Scholar, Ulrich's Periodicals Directory, WorldCat, East View, Cyberleninka, ERIH PLUS, DOAJ (Directory of Open Access Journals), Dimensions, EBSCOhost. 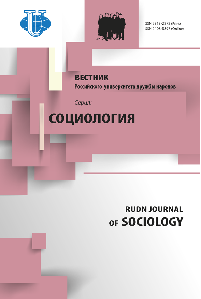 RUDN Journal of Sociology (previously Bulletin of Peoples’ Friendship University of Russia. Series Sociology) is a specialized peer-reviewed scientific journal established in 2001, and a quarterly publication. The Editorial Board of the “Sociology” Series includes not only the leading RUDN University lecturers and famous Russian sociologists, but also many renowned scientists from Austria, Belorussia, Brazil, China, Czech Republic, Netherlands, Poland, Serbia, Slovakia, Spain, Ukraine. The mission of the Journal is a broad exchange of scientific information, and of the results of theoretical and empirical studies of the researchers from different fields of sociology: history of sociology, sociology of management, political sociology, economic sociology, sociology of culture, etc., philosophy, political science, demography – both in Russia and abroad. The Journal is included into the “List of leading scientific journals under review, where principal data of applicants for scientific degree has to be published”, as decreed by Russia’s State Commission for Academic Degrees and Titles. Federal Supervision Agency for Information Technologies and Communications registration ПИ № ФС77-61214 от 30.03.2015.
ensures the widest representation of authors and experts from different countries and regions of Russia. The titles of the rubrics are generally broadly formulated so that, despite the obvious theoretical focus of most articles (this is the principal distinguishing feature of the Series forming the image of the scientific journal), in each section we can publish articles differing substantially in their area of study and subject matter, conceptual focus, methodological tools of empirical research, the country of origin and disciplinary affiliation. On the pages of the journal one can find papers concerning the current status and development trends in the higher education system in the macro-institutional context of different countries; or see publications on the historiography of the classical and modern periods of the world social thought; or read essays on the results of fundamental and applied research work and articles devoted to the problems considered by special sociological theories; or find translations of the works written by well-known scientists that are significant for sociological discourse; or read articles reflecting the difficulties in choosing a methodology and methods for the study of complex social phenomena, etc. We publish articles of the authors representing the leading sociological centers, institutes, organizations, and universities in Russia and abroad. The broad thematic ‘repertoire’ of the Journal presents the opportunities for the authors from many disciplinary fields (political scientists, historians, economists, etc.) relying on the empirical sociological data in their research. The target audience of the Journal consists of researchers who study various sociological problems at the theoretical and empirical levels, lecturers in sociology and other social sciences and humanities, graduate and postgraduate students. The Journal can be useful for the experts of sociological, information and analytical departments of the government, political and public organizations, and commercial structures. The main requirement to the published articles is their compliance in content and style with all the requirements set to highly professional scientific sociological publications, and for the rubric “Sociological Lectures”, additionally, an “explaining” manner of writing with some elements of epistolary imagery. Articles are accepted for publication only if they meet the requirements for manuscripts (see: Author Guidelines), successfully go through the peer-review process (see: Peer Review Process), comply with the international standards of publication ethics (see: Publishing Ethics), and meet the requirements for the references list (see: Reference list preparation guidelines). 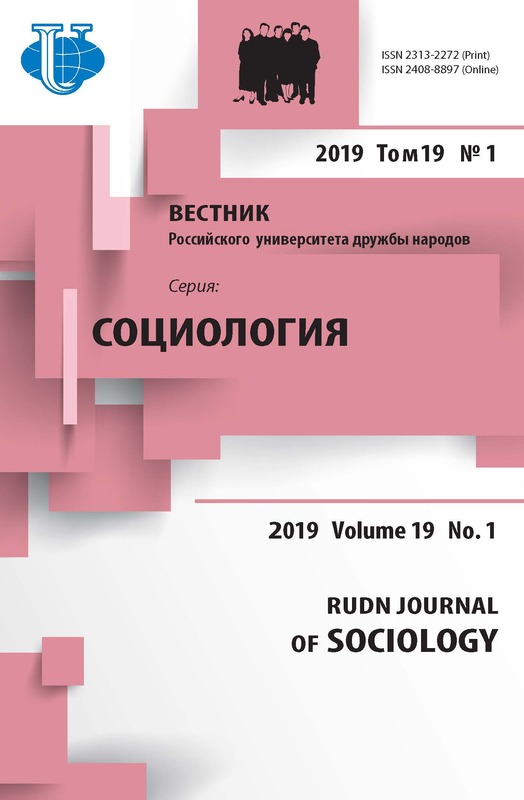 RUDN Journal of Sociology publishes articles in both Russian and English, which reflects the key orientation of the Editorial Board at strong international cooperation, promotion and further strengthening of the positions and achievements of sociological knowledge. The information on the new issues of the Journal is published in the Russian Scientific Citation Index on the regular basis. We thank you for your interest in our magazine and look forward to our cooperation!